The electric power industry deployed a contingent of seven incident management teams (IMTs) to Puerto Rico this weekend to support ongoing power restoration efforts across the island. These IMTs, each comprising seven to 10 operations experts, will be assigned to seven key regions on the island and will coordinate with the Puerto Rico Electric Power Authority and the U.S. Army Corps of Engineers, both of which already are working to restore power to the people of Puerto Rico. As part of the industry’s response, several electric companies are entering into a memorandum of understanding with PREPA. The MOU was developed by the American Public Power Association (APPA), the Edison Electric Institute (EEI), and the National Rural Electric Cooperative Association (NRECA), and will serve as a vehicle that allows electric companies on the mainland (that are members of APPA, EEI, or NRECA) to enter into emergency agreements to provide resources and workers to PREPA on a nonprofit basis. The first phase of the MOU will include the IMTs now being dispatched to the island. The initial IMT deployment will consist of storm response experts from investor-owned electric companies and public power utilities, with additional experts from electric cooperatives joining in a second relief wave. “Since our industry first received the request for mutual assistance from PREPA at the end of October, we have been working aggressively to provide crews, equipment, materials, expertise, and additional resources to assist with the massive power restoration mission,” said EEI President Tom Kuhn. “The development and agreement of the MOU and the deployment of the first IMTs represent major steps forward in getting the lights back on for so many who have been without power since Hurricane Maria ravaged the island in late September,” he said. “EEI and our member companies remain fully committed to doing all we can to assist our fellow citizens in Puerto Rico,” Kuhn added. 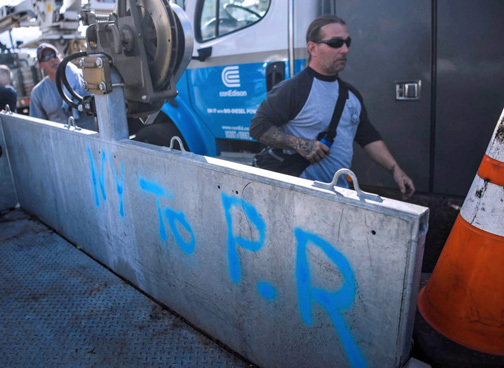 “We all know that this restoration mission is complex and difficult, and we will continue to work together with PREPA and our federal partners to overcome these challenges,” Kelly said. “We look forward to bringing those skills to bear as part of this unified restoration effort,” Matheson said. A team of electric company storm response experts, led by Carlos Torres (retired from Con Edison in New York), has been in Puerto Rico since early November and is coordinating closely with local officials, PREPA, FEMA, and USACE. The team also is coordinating with technical experts from New York, deployed as part of an intergovernmental agreement, who have supported assessment and restoration efforts since María struck in September. Gov. Ricardo Rosselló recently appointed Torres to serve as the Power Restoration Coordinator to oversee the multi-pronged restoration effort. The team is focused on assessing damages and putting into place a formal structure to support logistics, equipment needs, and supply chain issues and to ensure ongoing restoration efforts are safe, efficient, and effective, the representatives confirmed. In total, there are now more than 3,000 workers on the island who are dedicated to the power restoration mission. This includes PREPA’s own workers and crews mobilized under USACE contracts. This number will grow as full assessments are completed and the coordinated restoration plan is fully implemented. One of the companies joining the recovery effort is Pacific Gas and Electric Company, which has deployed a team of 11 emergency-management experts and field personnel from across the company’s service area. They will be part of a large group of key personnel from mainland energy companies who are mobilizing to help restore electrical service to the island. It will be a 30-day deployment. “Similar to our support of Florida during Hurricane Irma, PG&E has committed to help Puerto Rico in the aftermath of Hurricane María,” PG&E CEO Geisha Williams said. Hey Buddy!, I found this information for you: "7 US electric power ‘incident management’ teams in PR to help PREPA". Here is the website link: https://newsismybusiness.com/electric-incident-management/. Thank you.